Beachfront property in warm locales is not exactly in large supply, so it can be difficult to find an affordable home where you and your family can winter. For the past few years, though, SmartAsset has endeavored to uncover beach towns where the average American can afford to become a homeowner without depleting his or her savings account. To rank the most affordable beach towns in America, we examined four factors. Specifically, we looked at the median home value, the average number of rooms per house, median property taxes and median housing costs. Check out our data and methodology below to see where we got our data and how we put it together to create our rankings. Gulf Coast states on top Every city ranked in the top 10 is in a Gulf Coast State. Mississippi took four spots in the top 10, Florida claimed another four and Texas took two. California has the most expensive beach towns Seven of the 10 least affordable beach towns are in California. Two of these cities include Laguna Beach and Newport Beach. Gulfport ranks as the most affordable beach town nationwide. With home values slightly more than $118,000, it shouldn’t be too difficult to find an affordable home here. The latest Census Bureau estimates suggest the monthly housing cost here is $827. Relative to those in other cities we analyzed, Gulfport homes can be slightly small. The average home here has 6.1 rooms, the 89th most in the study. Pensacola ranks second thanks to low home values, affordable housing costs and relatively low property taxes. The median home here is worth slightly less than $156,000, 11th lowest in our study, and the annual property taxes for the average home cost slightly less than $1,200 per year, a top-20 score. 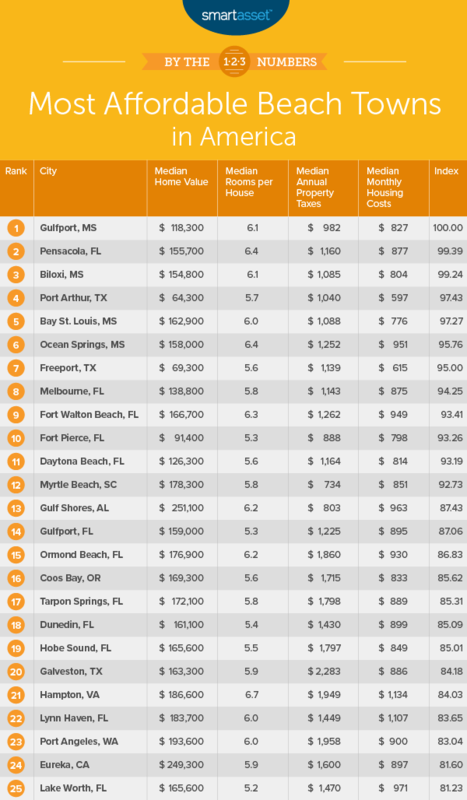 The average home in Biloxi costs just $800 per month, fifth lowest in our study. Along with low housing costs, property taxes should not stop the average American from buying a home here. Surveys conducted by the Census Bureau estimate the average annual cost of property taxes is slightly less than $1,100 per year, or less than $100 per month. In terms of raw affordability, Port Arthur is up there with the best. The average home here has a value of $64,300 and a monthly cost of less than $600. But the relatively high property taxes and small homes hurt Port Arthur’s ranking. Property taxes in Port Arthur are fairly high for its value, and the average home has fewer than six rooms. Back in Mississippi for number five, Bay St. Louis is just a bit less affordable than Port Arthur. Median housing costs here run just shy of $800 per month, or $9,300 per year. Property taxes here are also not too significant given the median property value in Bay St. Louis. The average property taxpayer pays $1,088 per year for an effective property tax rate of 1.64%. Mississippi’s dominance at the top of this list continues at number six. The average home in Ocean Springs is worth just $158,000. That means to afford a 20% down payment on a property in Ocean Springs, you would need just $31,600 saved up. The typical home here is also fairly large, equipped with 6.4 rooms, the most in our top 10. Freeport takes seventh and is the second Texas city to crack the top 10. The median home here is worth less this year than it was last year. But median housing costs and property taxes are slightly up. Overall, though, Freeport ranks second for median home value and median housing costs. Melbourne, Florida comes in eighth. Homeownership should be within grasp for many Americans looking in Melbourne. The average home is worth just under $140,000 per year. Compared to the nation as a whole, Melbourne is not equipped with the largest houses. 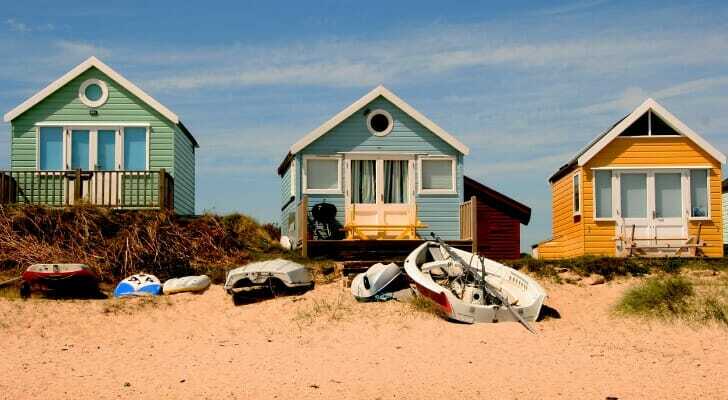 The typical home here has 5.8 rooms, 129th most according to our analysis of beach towns. Fort Walton Beach ranked at least 31st in three out of our four metrics. The city’s highest-ranking metrics came in median home value and median annual property taxes. It takes 22nd and 25th in these factors, respectively. Fort Pierce is located along Florida’s eastern coast and comes with a median home value of just $91,400. That ranks third lowest in that metric. The city also ranks in the top 10 for median annual property taxes and median housing costs. A low number of rooms in the average home keeps this beach town from ranking higher on our list. Home value. This is the median home value in each city. Data comes from the Census Bureau’s 2017 5-Year American Community Survey. Number of rooms. This is the average number of rooms per house. Data comes from the Census Bureau’s 2017 5-Year American Community Survey. Property taxes. This is the median property taxes paid. Data comes from the Census Bureau’s 2017 5-Year American Community Survey. Monthly housing costs. This is the median monthly housing costs. Data comes from the Census Bureau’s 2017 5-Year American Community Survey. We ranked each city in each metric. Then we found each city’s average ranking and gave the number of rooms a half weighting and all other factors a full weighting. Using this average ranking, we created our final score. The city with the best average ranking received a 100. The city with the worst average ranking received a 0. Don’t forget the extras After doing the math and figuring out how much your mortgage will cost, you may think you’re in the clear. Guess again. Extra costs like property taxes and homeowners insurance can make up a small but significant portion of your annual housing costs. Ask an expert Just because you can afford a house, doesn’t mean you should buy one. Before you buy a home, you need to consider your own finances as well as the overall market. A financial advisor can help you create a financial roadmap and determine if you’re ready to buy property. If you’re not sure where to find a financial advisor, check out SmartAsset’s financial advisor matching tool. It will pair you with up to three local financial advisors who can best meet your particular financial needs. 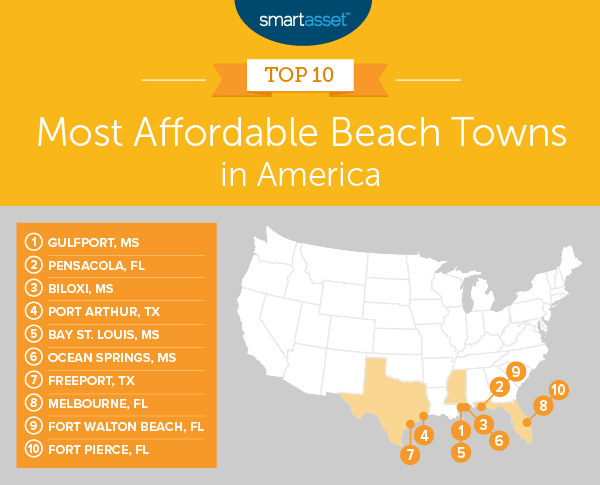 The post The Most Affordable Beach Towns in 2019 appeared first on SmartAsset Blog.